Oftentimes, aging parents or family members require specialized treatments for certain conditions, or they require surgical operations that consist of long recovery periods. Some people believe that in these cases, the only option is a hospital or institutional environment. Unfortunately, these places can be uncomfortable for many people, and oftentimes individuals need alternative healthcare solutions. Fortunately, with in-home nursing care, no one needs to sacrifice independent living for proper post-treatment or post-surgical care, as Florida First can refer caregivers who are certified to provide nursing services in the comfort of one’s own private home. All caregivers undergo rigorous screening in addition to submitting their credentials for review prior to being referred to you and your family. Certified nurse’s assistants (CNAs) all have home health aide certifications (HHAs), as do RNs and LPNs. Because the caregivers within our network maintain specialized certifications, we are proud to be able to refer them to provide in-home nursing services to our clients. At Florida First Senior Home Care, we refer caregivers with RN and LPN licenses who are qualified to provide specialized nursing solutions for our clients. This includes RN assessments, hourly RN or LPN care for patients who require consistent nursing care in their homes, and medication management and wound care. Being cooped up in the hospital after a routine surgery isn’t necessary with Florida First. Patients with complex medical regimens can safely and comfortably live at home and still receive professional medical care on a schedule that is convenient for them and that addresses all of their medical needs professionally. If your loved one needs nursing, we offer referrals of highly qualified professionals who can assist them on an as-needed or hourly basis, for 24 hours a day. Nursing caregivers can provide these services in your loved one’s home, or can travel to rehabilitation facilities or hospitals to provide additional care whenever they need it. Our aim is to make the process of geriatric care convenient, comfortable, and highly professional, in a manner that is convenient and comfortable for your loved one. All long-term care insurance policies are accepted, so there is no need to sacrifice in order to get your loved one the personal nursing care they deserve. 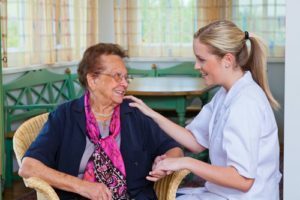 If you desire highly personalized care for your loved one who requires nursing services, and you wish to help them stay comfortably situated in their own home and avoid the process of institutionalization, Florida First Senior Home Care can help.